If you’re thinking about getting dental implants, you’re not alone. Three million people in the United States already have implants, and that number is growing by about 500,000 each year. In this post, we offer a brief summary of dental implants and their many benefits. Modern dental implants, which have been used successfully for over 30 years, are the strongest devices yet invented to support replacement teeth. When teeth are missing or removed, the only options are to leave it that way or add artificial replacement teeth. Traditionally, this required either dental bridges or dentures. But implants are often the best choice for adults and even adolescents, starting at about age 16 for girls and 18 for boys. Implants can be thought of as artificial tooth roots. They are threaded like a screw, and placed into the jawbone where it bonds with the natural bone. A connector, known as an “abutment,” is placed on top of the dental implant to hold an artificial tooth. The artificial tooth, called a crown, is custom-made to fit your mouth perfectly and match your natural teeth. Implants offer several advantages over bridges and dentures. The most obvious benefit to the patient is that they look and feel like healthy, natural teeth. And there’s no need for special oral hygiene—just brush and floss as usual. They also help you retain your natural face shape and smile, which can be affected by traditional bridge-work and dentures. In addition, they last much longer. When properly cared for, implants can last many decades. In comparison, bridges and dentures may need to be replaced as often as every 5 to 10 years. They also inspire confidence. Unlike dentures, implants can’t slip or click when you do normal everyday things like talking, eating, and laughing. 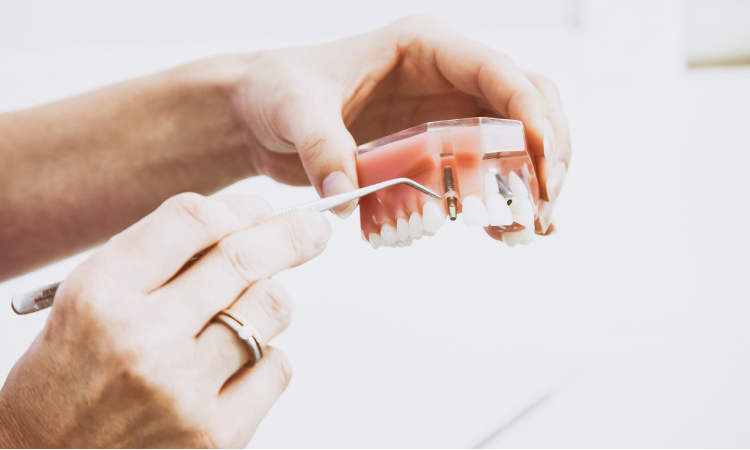 Implants also do not affect your speech, which can be a drawback of dentures or bridges. Finally, implants are the only tooth replacement option that actually helps stimulate bone growth and prevent bone loss. To learn more about your replacement options, contact us and set up a consultation with our team. We look forward to hearing from you!